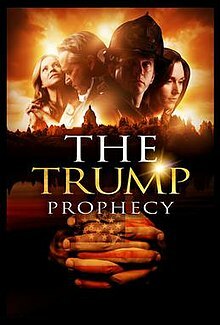 The Trump Prophecy is a Christian political drama film. It tells the story of Mark Taylor, a retired firefighter who believes that, in April 2011, God told him that Donald Trump would one day become president of the United States. The movie also portrays how Taylor's words helped inspire a prayer movement during the 2016 election. The Trump Prophecy is a production of Rick Eldridge's ReelWorks Studios, in cooperation with the film department of Liberty University, the evangelical Christian school founded by Jerry Falwell. It was directed by Stephan Schultze, the head of Liberty University's film program, and made with the help of many of the school's film students. The Trump Prophecy was screened by Fathom Events in theaters throughout the U.S. on October 2 and October 4, 2018. The movie was released on DVD on March 12, 2019. The film was made with a budget of about $2 million. Some Liberty University students created an online petition objecting to the school's involvement with the film. With a limited theatrical run, the film only made back $671,198 of its $2,000,0000 budget. It currently holds a 37% rating on Rotten Tomatoes. ^ a b c d Burton, Tara Isabella (May 30, 2018). "An Evangelical Christian University Is Helping Make a Film that Implies God Chose Trump". Vox. Retrieved September 15, 2018. ^ a b Kuruvilla, Carol (June 6, 2018). "An Evangelical University Is Helping Create A Movie About How Trump Was Chosen By God". Huffington Post. Retrieved September 15, 2018. ^ a b Markoe, Lauren (May 31, 2018). "Did Trump Fulfill a Divine Prophecy? What to Expect From a New Liberty University Film". The Washington Post. Retrieved June 6, 2018. ^ a b Zahneis, Megan (May 31, 2018). "A Man Says God Told Him Trump Would Be President. Liberty U's Making a Movie About Him". The Chronicle of Higher Education. Retrieved June 6, 2018. ^ "The Trump Prophecy". www.christianbook.com. Retrieved 2019-01-31. ^ Fern, Charles (July 4, 2018). "Students Object to University Role in Movie on Trump". Voice of America. Retrieved September 16, 2018.